We live in a state famous for its weather and beaches. We live in the cheapest beach city in the state. When I first moved here, I spent some good quality time enjoying the beach, then I got really busy and ignored it. When Gary got sick, I felt shame for not utilizing and enjoying my favorite godly miracle. So, I started going everyday. I read a lot of homeschooling blogs and everyone handles their day differently. If you live in a rural area, your kids probably get a lot of outdoor play. If you live in the city, your kids may not get nearly enough. If you live on the beach, your kids see more water than the fishes. 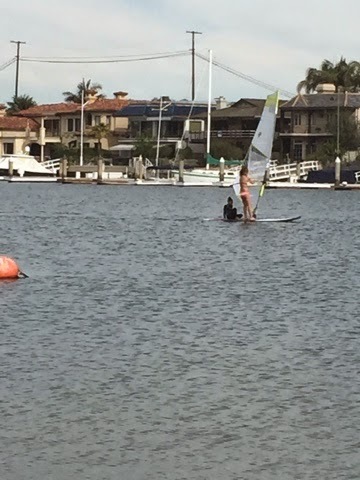 Now that I’m homeschooling, I don’t see the water as much as I use too, but we come every Wednesday to have school and play. 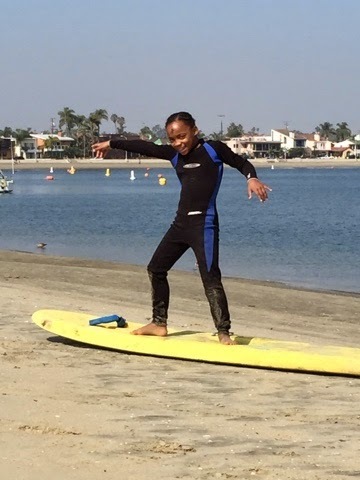 Last Wednesday, we took a day off and Harmonie went windsurfing. As I sat, with my face knee deep into my phone and Bluetooth keyboard working, I watched her enjoy a new experience. I felt happy and proud that my choices gave her such an opportunity. The choice to homeschool is a difficult one to make, especially when you are met with opposition. It is in those moments when you look at your kids experiencing things they may not have gotten the opportunity to experience, on a random Wednesday, because of school you realize it was the best decision you could have ever made for them. I think when homeschoolers look back on their childhood they will have fond memories of the random Wednesdays. The days that they had the chance to experience life and learn that taking a moment to breathe and enjoy life is just as important as getting the straight A’s on every report card. What do you do on a random day? Do you take time out of your busy home school day to just breathe? Let’s chat about it. I love and appreciate random days. I feel similar to you. The memories are priceless. The relationship building is priceless. I have learned so much by living life with my girls nearby. Some days we hang out with friends, go bowling, go watch a movie at the theater, or just play. 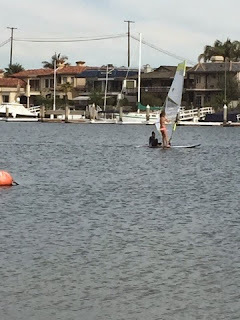 Windsurfing looks fun! Maybe I will aspire to do that one day. Fatinstac post however , I was wanting to know if you could write a litte more on this topic? I’d be very thankful if you could elaborate a little bit further. Thank you!